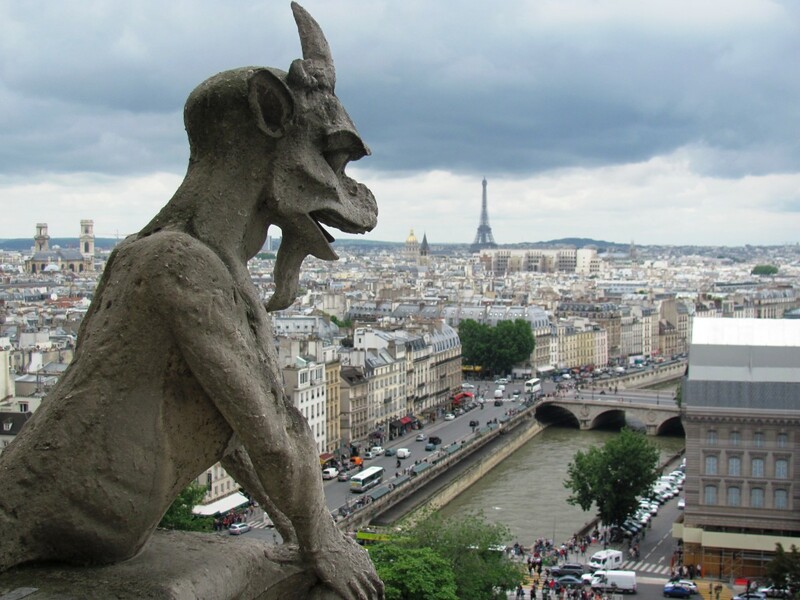 Poised on the Notre Dame Cathedral, a goat-shaped gargoyle looks out over the Paris sky. Perched high atop the towers of the Notre Dame Cathedral, ornamental stone statues peer over the Paris landscape. Some laugh, one spits, others look bored, feed on prey, or they grimace. What would they say if they could talk? The structures were added during the reconstruction of the church in the 1840s.2 So don't blame them for crowning of Emperor Napoleon Bonaparte or his predecessors. Don't cast aspersions on them for being mere spectators as 17,000 French citizens lost their heads during the Reign of Terror of the French Revolution. They weren't even here yet. Today they tolerate the prying eyes and camera clicks of tourists -- tourists like me -- who ascend the 387 steps to catch an up-close glimpse of these stone marvels.4 Catching a personal glimpse of these silent grotesqueses was one of the highlights of my Paris trip -- and well worth the climb to the top. There are no elevators here, and you can't see the statues well from the ground. If you are able, you simply must climb! The term "gargoyle" is often used incorrectly. Notice that these gargoyles are actually functional drainspouts. Chimera are pictured in the distance. What's In A Name: Gargoyle, Chimera, or Grotesque? In my trip up the tower steps, I learned that I had been calling those carved creatures by the wrong name all this time. And you probably have been, too. Chimera are ornamental-only sculptures. They are the statues often depicted as monsters or mythical beasts such as birds, hybrid creatures, or monsters. Gargoyles, on the other hand, are carved drain spouts designed to carry rainwater away from a building to protect the masonry from water damage. 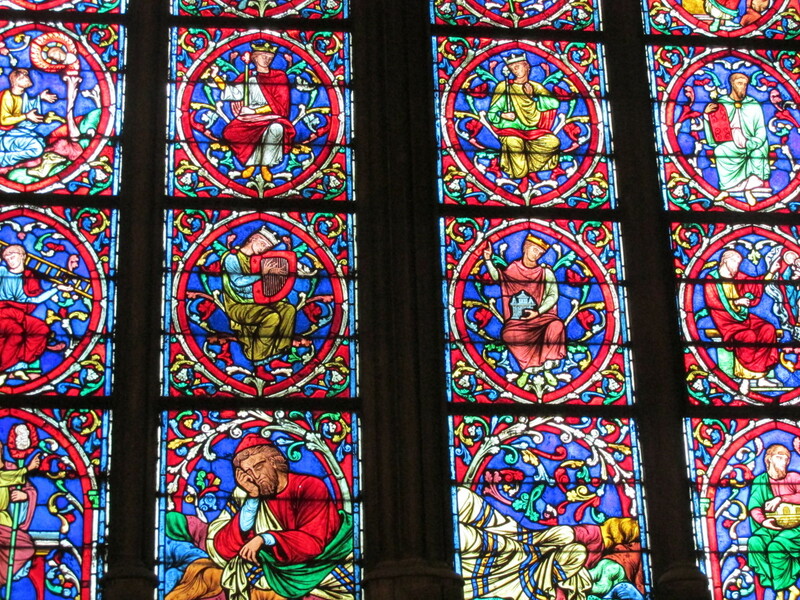 They have adorned the cathedral for more than 600 years.5 Ornate carvings of creatures with water coming out of their mouths are examples (see photo, right). As architectural elements, gargoyles serve a functional purpose, whereas chimeras are merely decorative. Grotesques is the generic term for such stone carvings, regardless of whether they carry water. How would you feel if everyone referred to you by the incorrect name for all of your life? Just sayin'. The term "gargoyle" originates from the French word "gargouille," meaning "throat" or "gullet." Related English words are "gargle" and "gurgle. "6 True gargoyles serve the practical purpose of carrying rainwater away from the building, thereby preventing deterioration of the cathedral's masonry. Modern architecture replaced gargoyles with gutter downspouts because gargoyles sometimes fell off buildings from the weight of the stone. The carvings also scared some people. The 1724 London Building Act, for instance, required all newly erected buildings in that country to be equipped with gutters rather than gargoyles. Although the Heron Gargoyle does a good job at scaring away evil spirits, he needs the wire on his neck to keep him pigeon-proof. What name will YOU be using for the decorative-only statues on the Notre Dame cathedral? First, they have been considered guardians of the church, warding away evil and protecting the inhabitants. Especially among illiterate populations that the church sought to convert, the statues were thought to come alive at night. 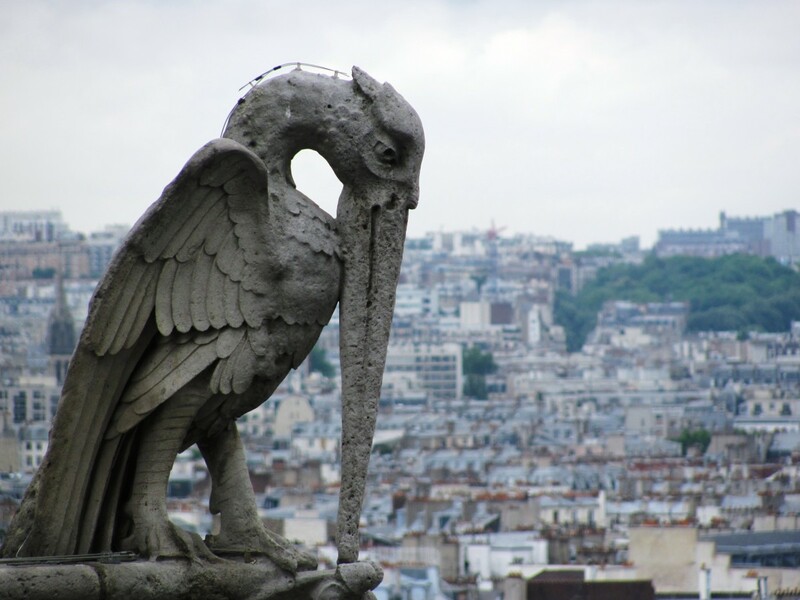 The winged creatures were believed to even fly around the city to protect citizens at night before returning to their stony perches before daylight. What are these fantastic monsters doing in the cloisters before the eyes of the brothers as they read? What is the meaning of these unclean monkeys, these strange savage lions, and monsters? To what purpose are here placed these creatures, half beast, half man, or these spotted tigers? I see several bodies with one head and several heads with one body. ... Surely if we do not blush for such absurdities, we should at least regret what we have spent on them. So perhaps our love of these eerie beings that still perch upon the Tower of Notre Dame is a blend of both rebellion (against those who would banish them) and fascination with the macabre? Whatever the reason, their sculptor, Joseph Pyanet, has created a legacy of mythical, magical wonders.10 May they outlast us all. 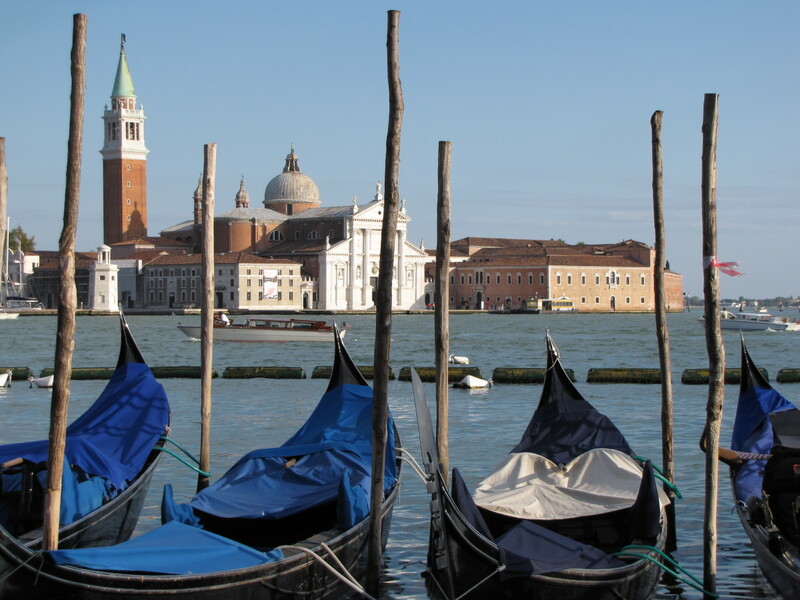 There is no entrance fee for the cathedral itself, and the fee to ascend the bell towers is nominal. Its cost is included in the price of a Paris Pass. We noticed, however, that some Paris Pass tourists were upset to learn that they had to wait in line like everyone else. During peak tourist season, lines can extend to two hours. My family instead opted to take a half day walking tour of the Île de la Cité (island city) which included a true skip-the-line of the Tower, in addition to a walking tour around the island flower market, several famous bridges, and inside the cathedral. The biographical anecdotes, architectural and religious explanations, and historical references were well worth the additional cost. I am not affiliated with any tour company -- just a happy tourist sharing my experience. Whichever option you choose, I hope you can spare the time to visit the towers of the Cathedral of Notre Dame. 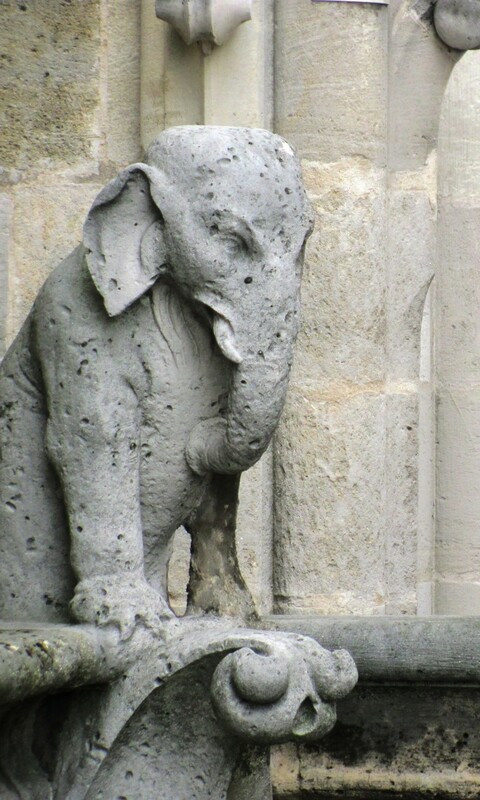 Elephants Can Be Gargoyles, Too! This guy doesn't look all that scary. Notre Dame ("Our Lady") is an 850-year old Catholic cathedral which typifies the grand gothic architectural style. 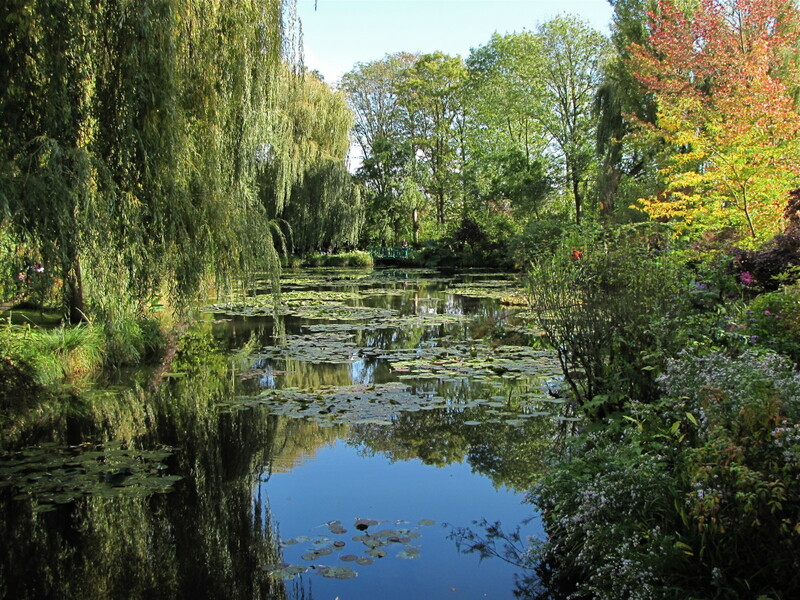 It is built in the heart of Paris on the city island in the Seine River. 1163-1345 - The cathedral was built. 1548 - During riots, Huguenots (French Protestants) damaged parts of the cathedral they considered idolatrous. 1558 - Mary Queen of Scots was crowned Queen of France at the cathedral. 1793 - The cathedral was spared from destruction during the French Revolution, having been rededicated as a "Temple of Reason." 1795 - The cathedral was sold to a private citizen who sought to demolish the building for its stone. It was returned to the Catholic Church in 1802. 1804 - Napoleon Bonaparte was crowned Emperor of France in the cathedral. 1940-1944 - During World War II, Notre Dame square became the center of French resistance against the Nazis. The cathedral withstood the tanks and guns of a four-day German siege. What a splendid view of the Eiffel Tower and the city below. Worth the climb! Video of Notre Dame and Its "Gargoyles"
1Encyclopedia Britannica. "Reign of Terror (French history)." Accessed July 6, 2013. http://www.britannica.com/EBchecked/topic/588360/Reign-of-Terror. 2Center of National Monuments. 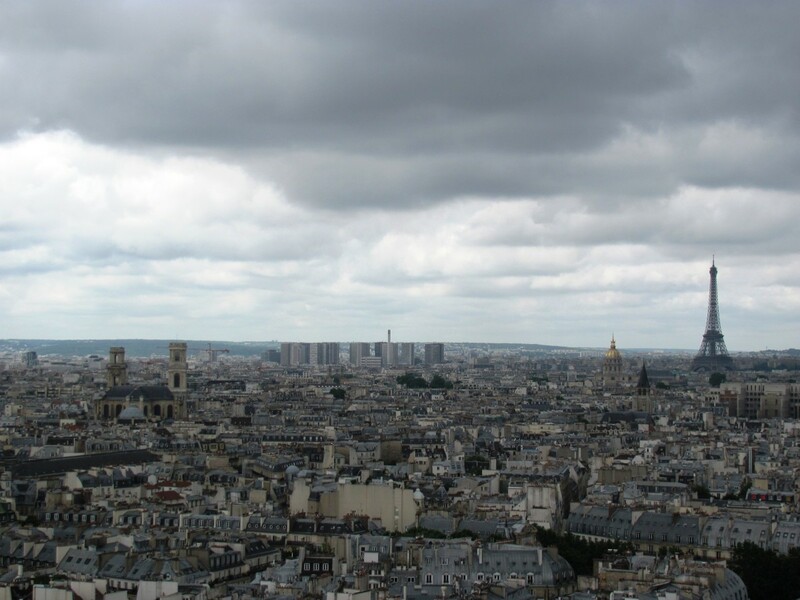 Towers of Notre-Dame: The Symbol of Medieval Paris. Paris: Center of National Monuments, 2012. 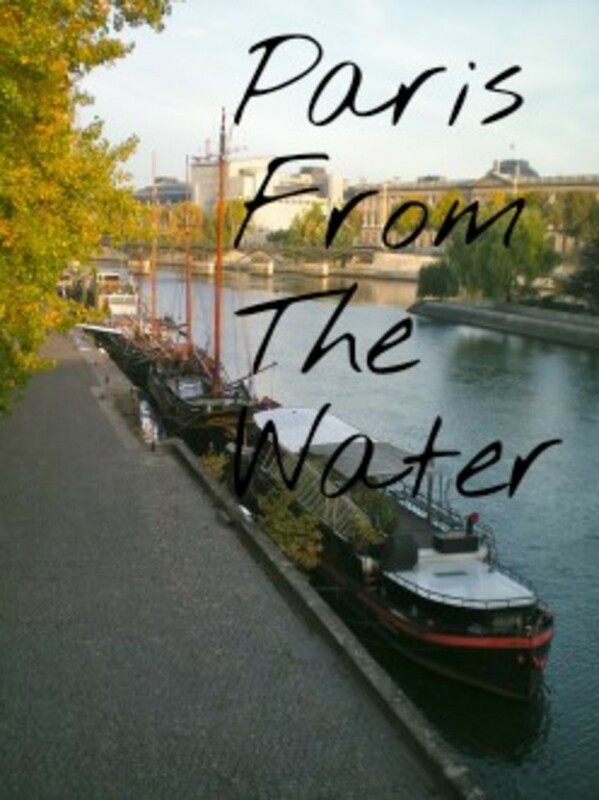 3France And Paris Travel Guide With Tourist Information. "Notre Dame Cathedral In Paris France." 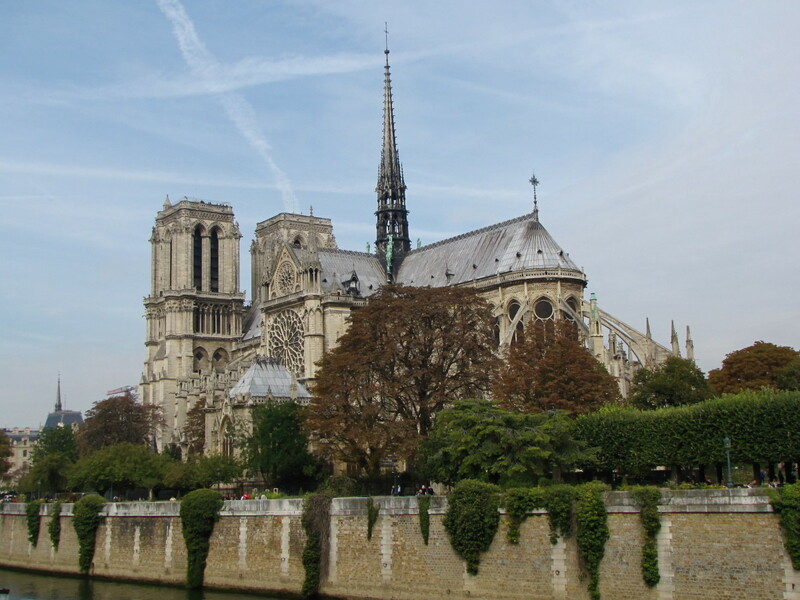 Accessed July 6, 2013. http://placesinfrance.com/notre_dame_de_paris.html. 4Cathédrale Notre Dame de Paris. "The Towers and the Crypt." 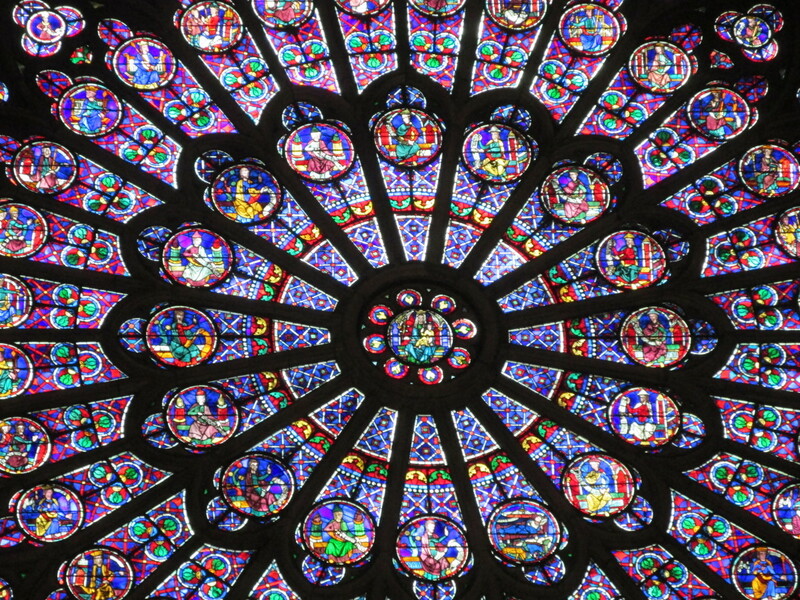 Accessed July 6, 2013. http://www.notredamedeparis.fr/spip.php?article477. 5Essortment. "The Gargoyles Of Notre Dame." Accessed July 7, 2013. 6Wikipedia, the free encyclopedia. "Gargoyle." Last modified July 5, 2013. http://en.wikipedia.org/wiki/Gargoyle. 7Crystalinks Home Page. "Gargoyles and Grotesques." Accessed July 7, 2013. http://www.crystalinks.com/gargoyles.html. 8RoadsideAmerica.com. "Washington, DC - Gargoyles, Washington National Cathedral." Accessed July 7, 2013. http://www.roadsideamerica.com/tip/16898. 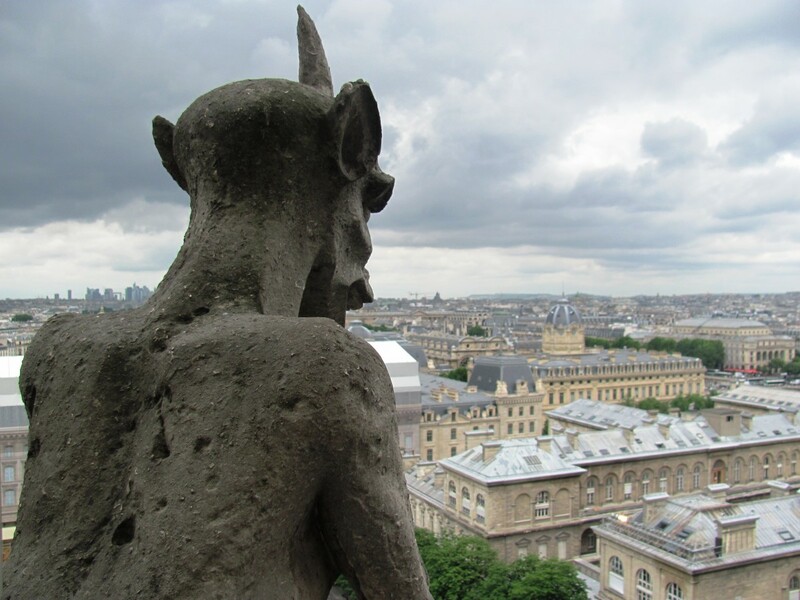 9Dixon, Laurinda S. "A Review Of The Gargoyles of Notre-Dame: Medievalism and the Monsters of Modernity." NCAW. 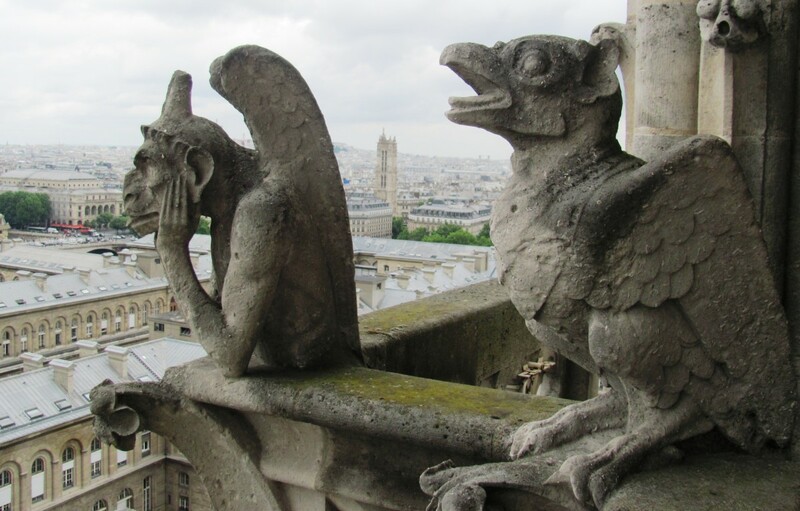 Accessed July 7, 2013. http://www.19thc-artworldwide.org/index.php/autumn10/the-gargoyles-of-notre-dame. 10Home Page for Northstar Gallery. "Historical Base for Gargoyles - Northstar Gallery." Accessed July 7, 2013. http://northstargallery.com/gargoyles/aboutgargoyles.htm. Who are the statues which appear to be kings and queens half way up the Notre Dame cathedral? 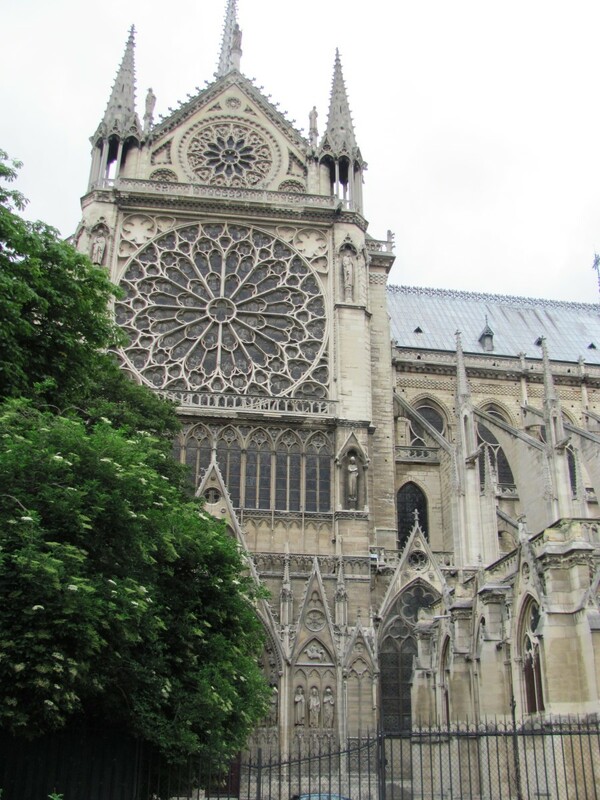 Located just below the rose window on the west-facing exterior of the Notre Dame Cathedral is the Gallery of Kings. This is a row of 28 statues portraying the monarchs who ruled over the ancient Kingdom of Judah (its capital was Jerusalem). The monarchs are descendants of Abraham and human ancestors of Mary and Jesus. 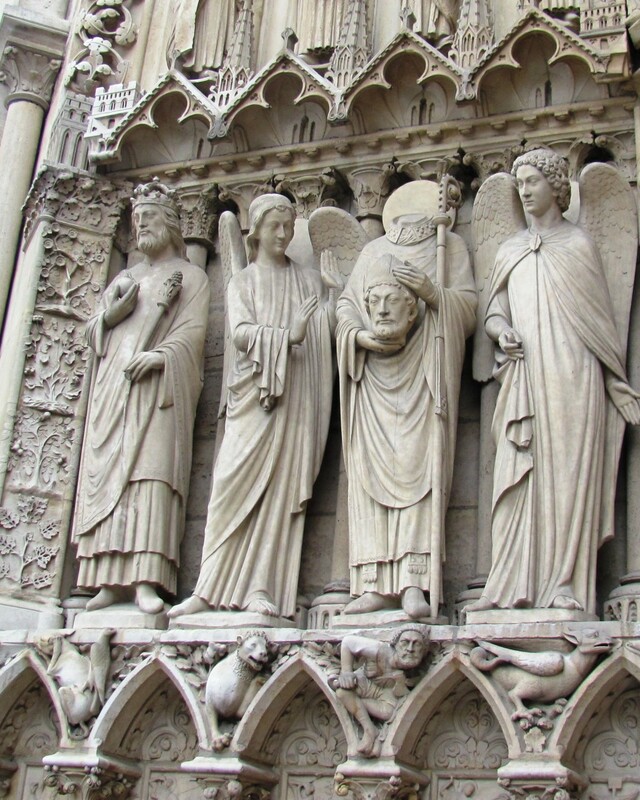 While the Notre Dame statues were placed on the church in 1220, the Gallery of Kings was actually installed 1140 to 1250, A.D. on multiple French cathedrals, also including those in Amiens, Reims and Chartres. Note that the number of monarchs varies from 18-56 in these cathedrals depending on the biblical source used, and the Gallery of Kings is only found only on those cathedrals dedicated to Our Lady (Notre Dame). The Gallery of Kings symbolizes Christ’s royal lineage; according to the Bible, Jesus was descendant of Jesse, father of King David. 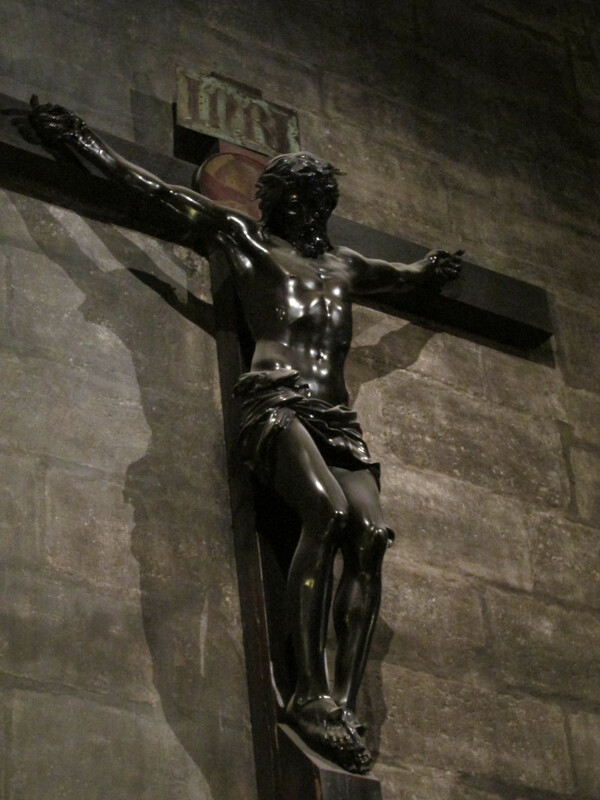 For centuries, the painted statues quietly blessed the church. However, in 1793, following Marie Antoinette’s beheading during the French Revolution, a mob called for the heads of more royals. The angry crowd mistook the Gallery of Kings for French monarchy and used rope to pull them down from the cathedral exterior. The stone kings were unceremoniously decapitated, and then they disappeared. What you are actually seeing on the Notre Dame exterior are 19th century replicas. The stone remnants were eventually placed on the streets in 1796 during a clean-up campaign and sold by the government at auction to a building contractor. A strict Catholic, he obeyed church law dictating that any objects or remains removed from a cathedral must be destroyed by burning or burial. Thus, he buried the 21 heads that he had−each measuring about two-and-a-half feet−until they were discovered in 1977 beneath the basement of the French Bank of Foreign Trade in Paris. The heads and other original Notre Dame fragments can be viewed in the Musée de Cluny in Paris. Peg Higgins - Sadly, yes. Maybe they were overwhelmed this time, who knows? Good will triumph. I think that's already showing. Pedro Frederico de Figueiredo Garcia - Thanks for your interpretation. Aren't the Gargoyles used to warn off evil around the churches? This tragedy days before Good Friday it's an advice to all Christians to refound Faith. Bob - Yes, you are are right. It is sad what happened today. The only consolation is there was no loss of life. Monica - I felt that too. 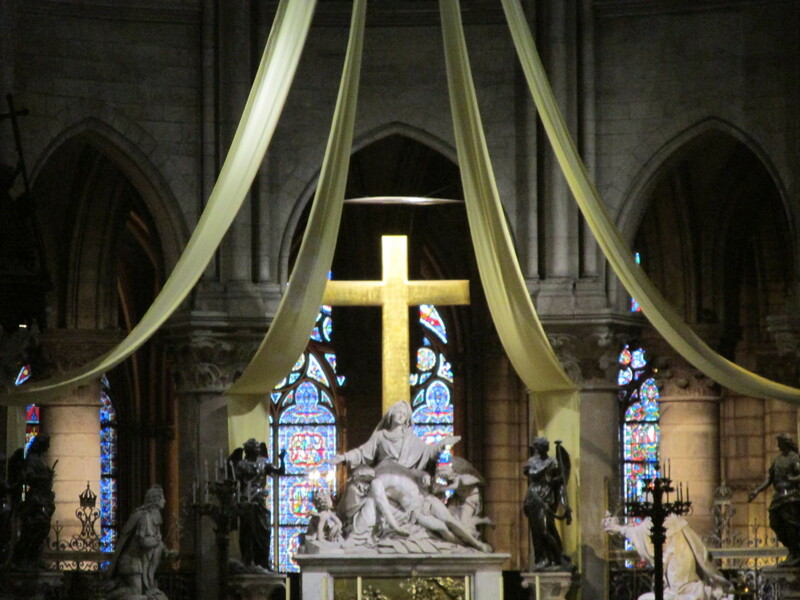 I am not an overly religious person, but each time I have visited Notre Dame I have felt spiritually and historically connected. When I saw it burning on television today I immediately thought, "How devastating -- God's house is burning." I don't know if there is special religious significance with the Monday before Easter. I understand there is something about the "cleansing of the temple" on that day (?) but not being Catholic I do not know how to interpret that. Maybe just a sad coincidence. Regardless, the loss of this cathedral is tragic for all of us on so many levels. Thank you for your comment. Watching the cathedral burn is disheartening, but it seems to have a spiritual meaning. I am curious to know if anyone thinks the same. drrusl - Hooray for your triumphant spirit! I'm glad you fulfilled your dream in climbing those stairs to see the chimera and the view from the top. So happy you enjoyed this. Thanks for the informative post! We were in Paris in 2018 and I fulfilled a lifelong dream by climbing the towers despite having had serious back surgery a couple of years prior. I could not get enough of the gargoyles/chimera! Your post made me smile and remember how fabulous Notre Dame and Paris were. Many thanks! Thanks for the tip. Last time we were in Paris visiting our goddaughter we considered going up, as we were nearby, but got deterred by the long queue. Liz - I recommend doing one of the "skip the line" tours when you go. There was a very long line to get in and our group just went right up! I really enjoyed this article. When our kids were younger, they had the Disney film, 'The Hunchback of Notre Dame'. We've been to Paris a few times, but never made it up the towers. It's on the list now for our next trip there. Robert - Thank you! It was unforgettable and well worth it. jhon - I wish I could tell you, as I have yet to see a sourced number I can trust. 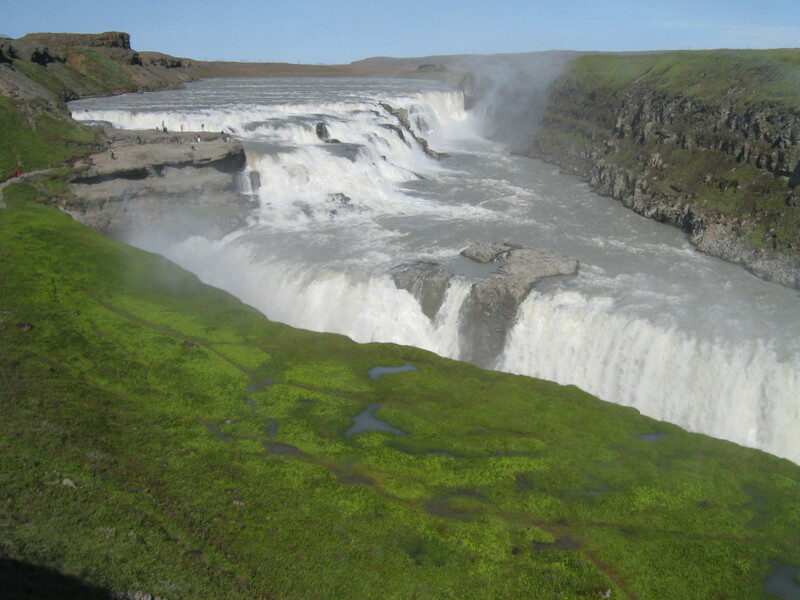 When I visited, I didn't find an official number listed in any of the documents available to tourists. Thanks for asking this very good question, though. TW - Thank you for stopping by and for the time you took to share your views. It's important to maintain the original or eldest definition/structural integrity of the buildings attributes, even if they are not current or modern beliefs, it gives people/students/etc a place to begin studying anthropology and history. Not only by looking at the physical product, but looking at the designer and his or her thought process, along with demographics can illuminate a multitude of ideas of how and what we are evolving into as a human species. One could even look into the group requesting this kind of work. Alun - It was one of my favorite stops in Paris. 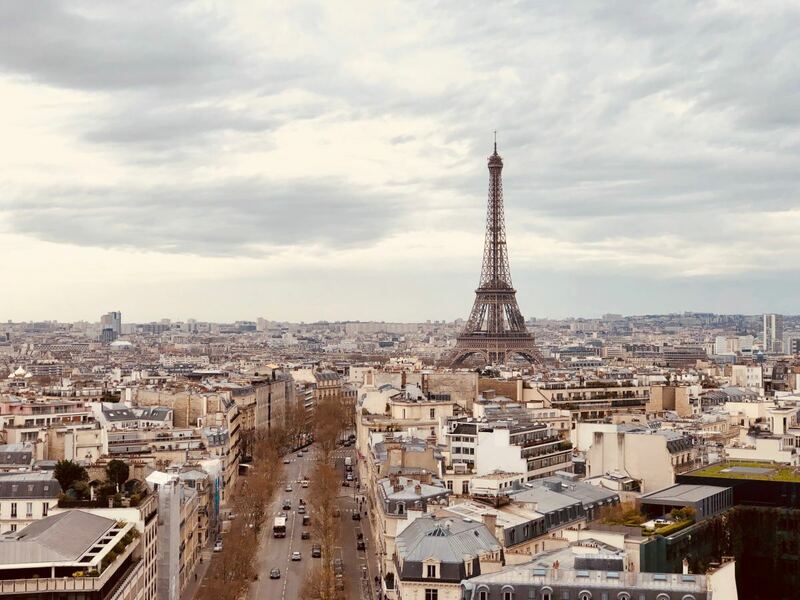 Although I had been to Paris before and to the Notre Dame, this way definitely a better trip for having viewed the chimera close up and having been able to both photograph them and see Paris' breathtaking cityscape. Hang on to that camera, though, as it's a long way down! Have a wonderful week and thank you for commenting. Good article Flourish, and illustrated with your own very good photos. Much of the information was new to me. The terminology of grotesques, and their history, was interesting. I did not know the chimera on Notre Dame were only added in the 19th century, but perhaps that mirrors what was going on in Victorian England where there was considerable interest at that time in recreating the look of Roman or Medieval architecture. I like also the 12th century comment by St. Bernard of Clairvaux. Though I disagree with his opinion of gargoyles, it is a very eloquent and clever comment. I once wrote an article about photographing the detail of buildings in Paris, so of course it's nice to see a hub specifically concentrating on gargoyles (or grotesques) and also showing some of the Notre Dame stained glass windows. Peoples' experience of buildings like this is enhanced if they can appreciate the fine work which has gone into them - and particularly in the case of these figurines which in their day required such skill and daring to place them, and sometimes in positions so far up in the sky that they can scarcely even be seen from the ground. Debbie DeCarlo - To the best of my knowledge, it has to do with politics and the conflict between the Catholic church and the French state as well as the symbolism of some of the birds (e.g., owl as the harbinger of death). Let me refer you to a fabulous book, The Gargoyles of Notre-Dame: Medievalism and the Monsters of Modernity By Michael Camille. Why were the gargoyles not replaced by great birds inside? Suzanna - Thanks so much for your encouraging feedback. I loved not only the view above Paris but also the architecture. I do hope you're able to take your little one back with you one day. Wow, thank you!. I loved your research, and writting about Notre Dame. 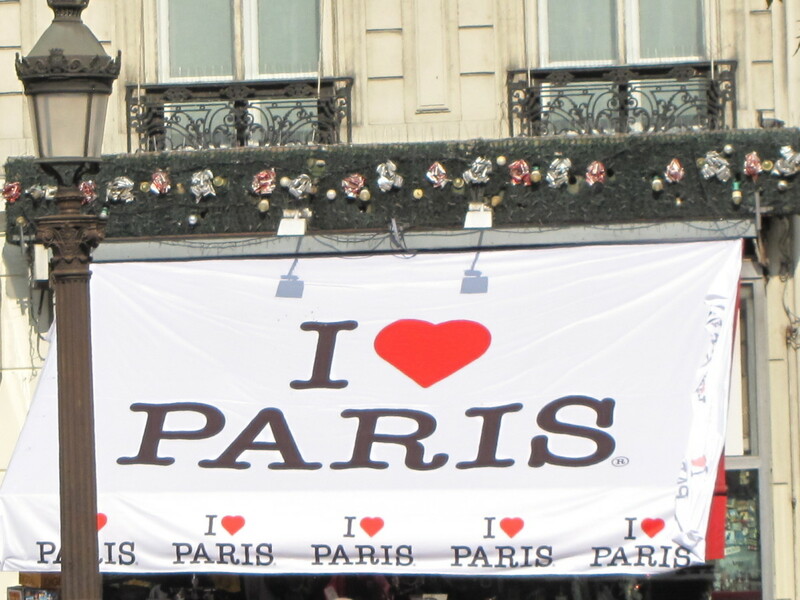 I agree, it is a must see if in Paris. I had the chance to visit this summer. I will return when my toddler is older. Susie - I had little idea myself until we took the trip there. It was one of the highlights of our Paris trip. Thanks for stopping by and have a terrific weekend! Thank you for the educational hub about gargoyles and chimeras. I didn't know the difference till now, but then I had not read much about them. This really is another AWESOME article, Flourish. Cherylann - Walking in such a historical and beautiful place was an adventure in itself. It was so grand and beautiful, both inside and out, and even as we walked they were having a mass, as it is a working cathedral. Thanks for reading and commenting. Hi FlourishAnyway! Such a beautiful hub and I'm glad I came across it. Well, the first time I was acquainted with these grotesque, but splendid architectural masterpieces was in the book Harry Potter, and I've been taken up by them ever since. Having read your hub and the myths surrounding these beasts, a thought crossed my mind. There is such a difference between our ancestors and us. Although we pride ourselves on modernity and all our innovations, there is a loss of belief in all things magical and mystical. So practical and rational have we become, that we've actually missed out on the wonder and fancy of folklore and mythology. spiritwood - So glad you enjoyed this. Climbing to the top of the tower was one of the best parts of our France trip --such a gorgeous view. Anna - Thank you so much for reading and commenting. It was such an enchanting cathedral, inside as well as out. Really fascinating and your photographs were excellent. I have always thought gargoyles were interesting, but now that you have given me the facts I know they are. Great content and the level of research you must have undertaken shines through clearly. Shasta - Thanks for reading and commenting. The climb to the top was as interesting as the tour inside the cathedral, although very different. Glad you found this a good hub. 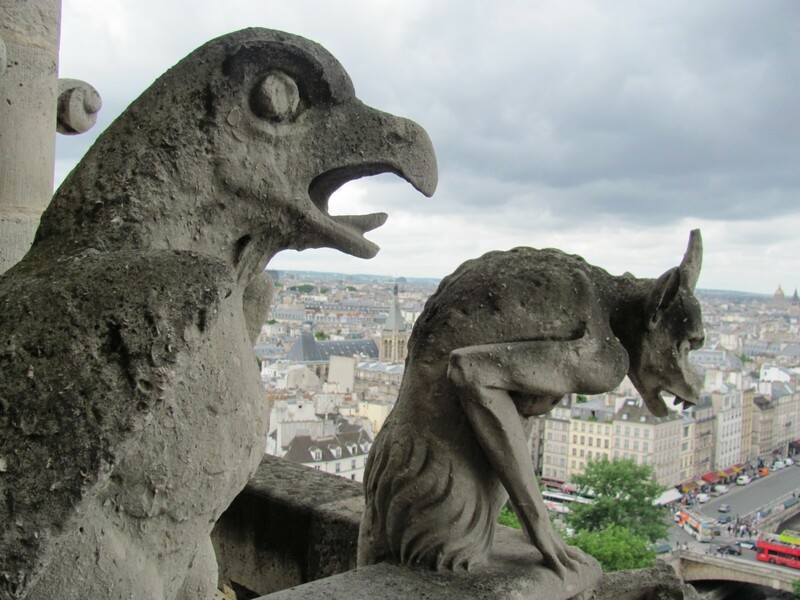 I've been to Notre Dame, but we didn't have time to wait in line and go to the steps to get an up close view of the gargoyles / chimera / architecture. Thanks for the up close tour. It is fascinating work. DDE - Thanks for reading and commenting. They are very intriguing -- one of the highlights of my trip to Paris! Glad you enjoyed the photos. 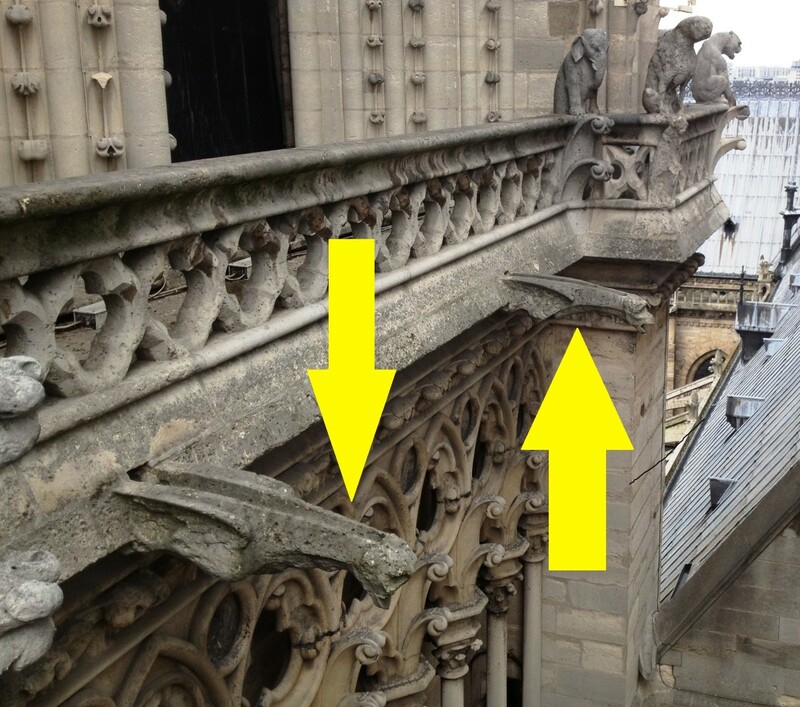 The Gargoyles of Notre Dame Cathedral beautiful photos and your hubs are most interesting and informative. ologsinquito - Thanks for reading and commenting. Notre Dame Cathedral is a beautiful place, whether you are inside the church or atop. Hope you get a chance to visit it some day. This is a great article that truly takes you to the place you're right about. For a few minutes, I actually felt as if I was looking at part of Notre Dame Cathedral, a church I've always wanted to visit. Seshagopalan - Thanks for taking a look at the hub. So happy that you enjoyed it! You present me a playing video before my eyes.. 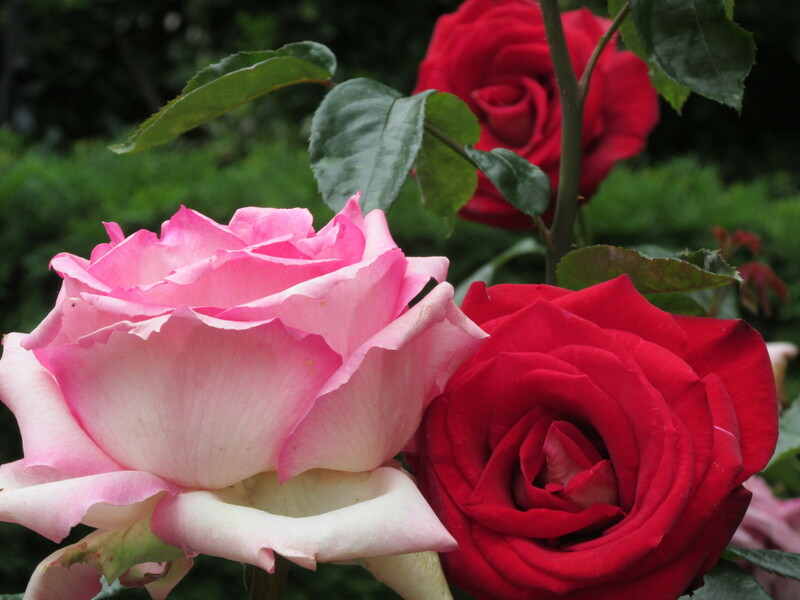 Awesome.. Great photography..
Carolyn - Thank you for reading and commenting. It is a magical place and I'm glad the photography did its beauty justice. Ella Quick - I do hope you are able to go to Paris one day! The gargoyles/chimera are calling your name. 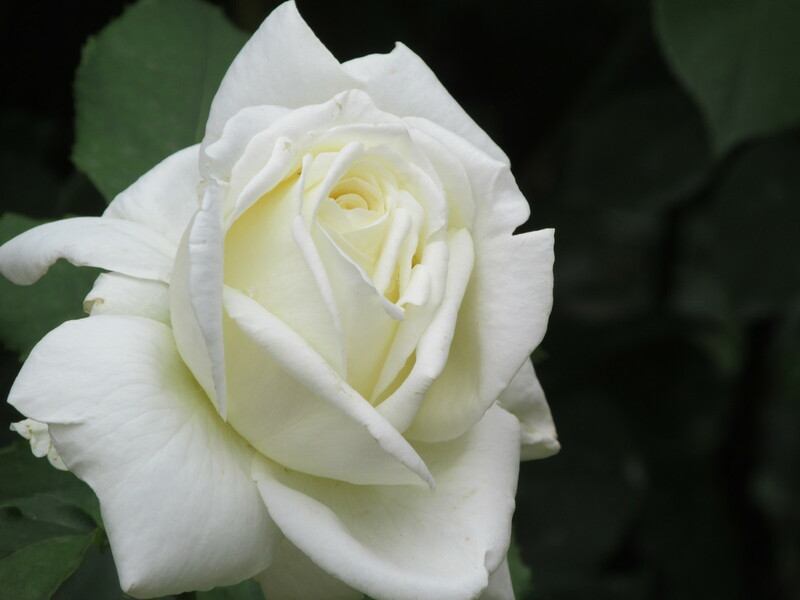 Sally - Thank you for reading, commenting and voting. Notre Dame is a fantastic, mystical place definitely worth a visit! What a great topic for a hub. 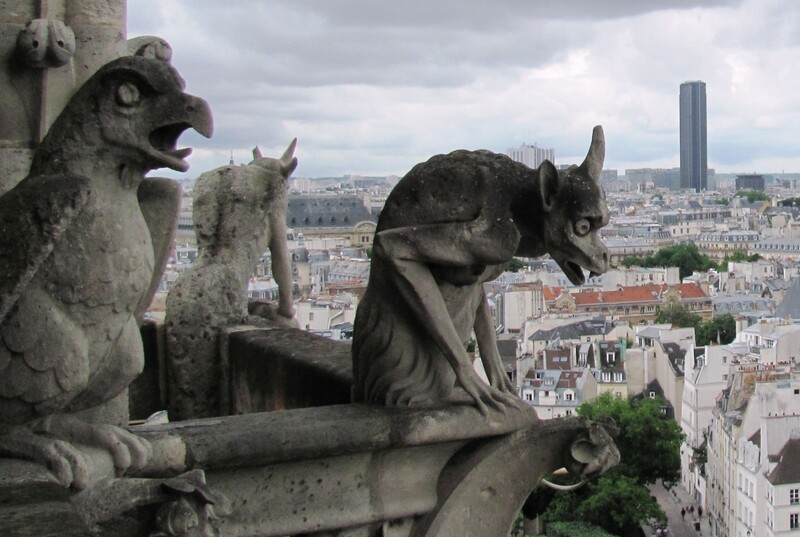 The gargoyles are fascinating and if I ever get to Paris, you've definitely inspired me to check them out. Leslie - Thank you for the kudos. I appreciate the kind words and encouragement. Notre Dame was a fantastic place to visit. Rebecca - Thank you for reading and looking at the photos! It was a very special place to visit. Nell - I enjoy them too. They usually have such unusual expressions, some funny, some scary or happy. They are quite bemusing. Thank you for the visit and share! Those gargoyles are some more characters. I love your photos of Paris! prasetio30 - Glad you enjoyed this hub. It is a spectactular cathedral, inside and out. Thank you for reading and commenting. I really enjoy this tour. I had never heard about this before. Thanks for sharing with us. Voted up! bingskee - So glad you enjoyed this. Even if you may never visit, it is always nice to look at faraway places. Have a great day. lovely hub! and interesting, too. even if i might not have the chance to visit, just reading filled me with enough information. Peggy - It was quite an amazing trip ... so busy that I had to take a vacation to recover from it 2-3 weeks later. Thank you for commenting, voting, sharing. I appreciate it! Another amazing hub! Now I know the difference between gargoyles and chimeras thanks to you. Glad that you climbed those steps and were able to take those fabulous photos. Enjoyed reading and viewing this hub. That was some amazing trip that you took! Many up votes, sharing and pinning. kidscrafts - Thanks for visiting and sharing your experience with Notre Dame. It is a magical place, whether inside the cathedral or from the roof. I can just imagine how lovely the singers must have sounded. 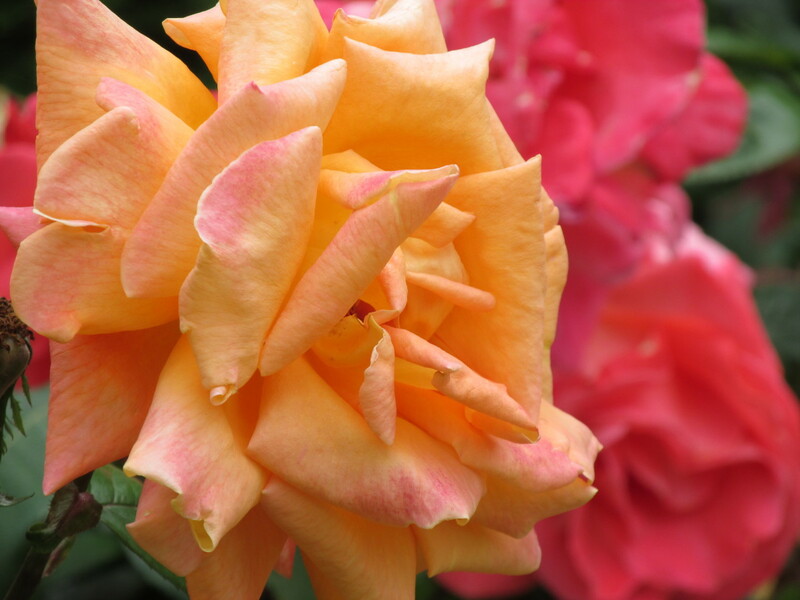 Thank you for sharing this great hub and your fantastic pictures. My husband and I visited Notre Dame Cathedral a few years ago but we didn't climb those steps and I don't remember the reason (but we climbed the Eifel tower). During the visit of the Notre Dame Cathedral there was a Russian ensemble singing and the sound of their voices in the Cathedral was just divine. Voted up, awesome, beautiful and interesting! Victoria - Thanks for reading, voting, and commenting. There was one that I didn't feature (because it had people in the background) that looks like he was nearly choking on a meal of some animal. Great expressions. Now I am completely into the whole grotesque statue thing. Wow, this is so thorough. The history, the dates, the photos. The hyena gargoyle cracks me up! Great job. Voted up and more! Heidi, Thanks for reading, commenting and sharing. It was a wonderful trip to the top and something I highly recommend for anyone visiting Paris. What amazing pictures and an incredible hub! Thoroughly enjoyed and shared! Bill - I do hope you can visit Paris. It is fantastic. The first time we went we had no plan and just roamed the city, visited landmarks at leisure. The second time we had a well mapped-out agenda. Both had their advantages, but I agree with you about using local guides. No need to waste time in long lines. Thanks for reading, commenting and sharing. Hi FlourishAnyway. A great look at these mystical creatures. I can't wait to visit Paris and the Notre Dame Cathedral someday. We also try to use local guides when traveling. It really adds to the experience and skipping any lines when on vacation is a must for me. Great job. Voted up, shared and pinned. Elias - Thank you for your kind comments and for pinning. It was an awesome place to visit -- mysterious, magical, and a beautiful view of Paris. Excellent hub and great photos. Enjoyed the read and the detailed information you provide. Voted and pinned! bravewarrior - Thank you for the encouragement and for reading. I thought the dipping the hand in the holy water was kind of funny too. I think he was just ill-informed, kind of kid-like. For a second I wondered whether he might even take a sip. My husband was raised Catholic and even has relatives who are "of the cloth" so he tries to keep me on the straight and narrow. I have been known to innocently not pay for a church pamphlet I found interesting (who knew -- I thought they were free? 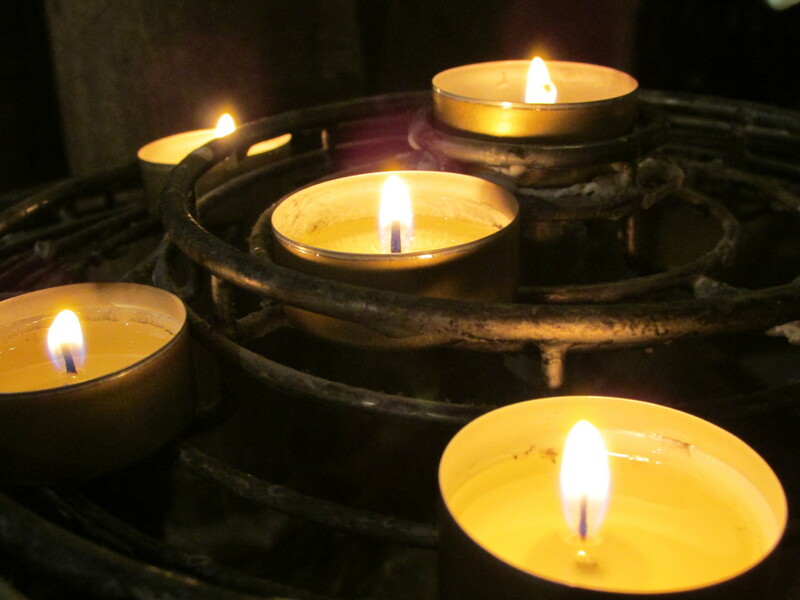 ), and I once lit a bunch of candles in one Catholic cathedral, thinking I was doing a favor. He shakes his head and gently sets me straight. I'm not a quick study in this area. What a delightful and informative hub! All my life I've been calling Chimeras by the wrong name. This is so interesting and you certainly have done your homework! What an awesome experience visiting Notre Dame must have been for you. I got a kick out of the guy in the video who kept dipping his hand in the Holy Water. Apparently, he's not Catholic or he'd know what to do with it! Great hub. Thank you so much for this magical read. Very rightly said flourishanyway, life indeed is quite short, so make the most of it. zeusspeak - Thanks for reading. I see that you are in London. You simply must find a way to do this one day! They are so marvelous! I loved them so much I am going to professionally frame some of my travel photos and hang them in my house to remind me of my travels. Life is so short. I hope your travels take you to everywhere you want to go. Rose-the-planner - I think I am with you. The Spitting Gargoyle has such personality. It is such a shame that the sculptor of these great works of art is a virtual unknown these days. Jabelufiroz - Thank you for the read and vote. Hope you have a chance to visit these mystical beings. Glad you enjoyed! Useful travel guide FLOURISHANYWAY. Voted up. Thank you, vespawoolf! My husband and I were there in 1995 and never climbed the Towers, not realizing there was a reason good enough to do it. I do hope that one day you can return. Thanks for reading, commenting and sharing. 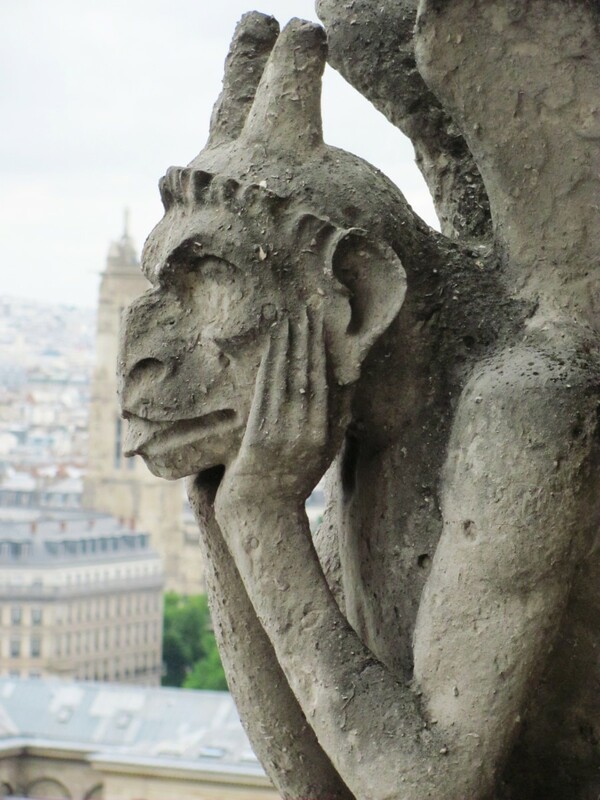 Thank you for sharing your gorgeous photos of the chimeras of Notre Dame! Unfortunately, due to a lack of time we only saw them from the ground. Now I will definitely set aside the time for a climb to the top if ever we make it back to Paris. I really enjoyed your photos and the historic information. I didn't realize that gargoyles also serve a practical purpose. Voted up and shared! purl3agony - Thank you for the visit, comment and share. It is such a majestic place, inside and out. It was my second time visiting, and I could keep going back and back. Great hub! I remember learning about Notre Dame in my college art history courses. It's fun to revisit this information and enjoy your great photos!! Thanks for sharing this info!